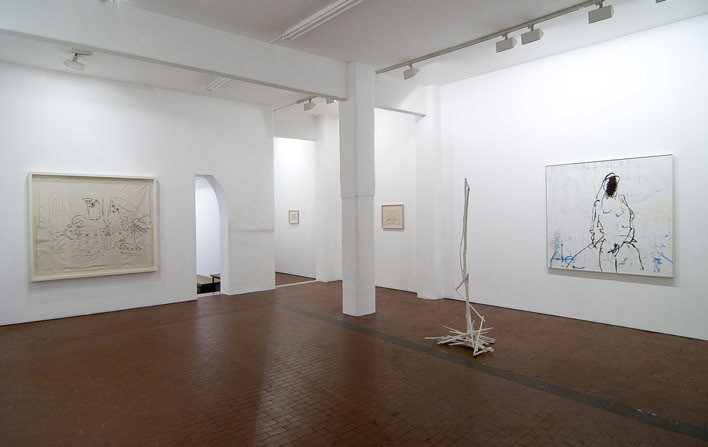 Friday 19 February 2010, internationally renown English artist Tracey Emin opens her third show with Galleria Lorcan O’Neill Roma. Why Be Afraid... showcases Emin’s newest projects across her full spectrum of media, from neon to embroidery, from a large painting to a tight-knit group of small monoprints, whose austere and provocative nature reflect aspects of the artist’s own personality and approach. Publicly putting on display her hopes and humiliations, failures and successes, Tracey Emin ultimately turns both joy and catastrophe into self-confrontational, confessional art. Through her work, she explores themes of marriage and death, of pregnancy and abortion, and connection that people often make between the two, often out of fear. These raw themes are balanced by Emin’s tender and evocative drawings and embroideries, and by a new neon that candidly proclaims I think I love you!. Two large-scale embroideries mix traditional iconography of the Annunciation with an imaginary autobiography, linking the art of the past and classical tradition (Giotto in particular) to the contemporary. Emin plays with this concept, morphing the antique, typically feminine medium of needlepoint into a challenging, self-determining instrument in today’s world. In addition to the embroideries and monoprints exhibited in the gallery’s two spaces, a selection of Tracey Emin’s video works will be screened at the neighbouring Film Studio, a landmark experimental cinema in Rome.